We have never personally experienced someone directly making comments such as the ones the actor made. But we have had TONS of scowls, stares, glares, head shakes, eye rolls, whispers, minor comments, and parents who don’t allow their kids to play with ours. It is heartbreaking, obvious, sad, and unfortunate. And I hate that my son and our family have to be subjected to this kind of treatment. But all we can do is do our best. To be kind, to educate when asked, to love others as we want to be loved, to pray for those who are ignorant or who choose ignorance, and to work constantly with Cannon to help him to be more comfortable and calm in public. It is a process. A learning experience for ALL of us. And it will take time. But that is just the way it is……. The hardest part for us is when we are in public and Cannon’s shirt comes up, revealing his diaper. This is the one that I DO get verbally chastised for often. I have heard so so many suggestions, critiques, and outright mean-ness. Things like…..”How could you LET him wear that?” Or “You know you COULD potty train him!” Even children have teased him, calling him a baby and singing songs of a teasing nature. First, I want to scream that he has Autism…..he is not DEAF. And that their words hurt, whether they think he hears them or not. That he IS a real person with real feelings who IS trying to learn. Our doctor believes that their may be a disconnect between his brain and his “lower half”……not allowing it to get the message that he needs to go to the bathroom. Do I go into that kind of detail with a stranger? I also want to just burst into tears……tell them the whole story of the last 2 1/2 years. 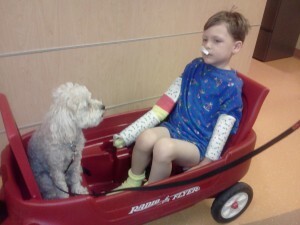 About all the hours sitting in the bathroom trying every method and reward system known to man, the tears (both his and ours), the doctors visits, tests, procedures and hospitalizations. And sometimes I just want to whip out his Beads of Courage and allow them to do the talking. But again, I just have to do what Jesus would do and be kind, treat them with love, and the way they would want to be treated. Sometimes I explain a little. If Cannon is out of ear shot…….due to my previous statement about him not being deaf. And sometimes I just remove my family from the situation. It just depends. I recently found a couple of very useful and informative lists that I want to share with you now! This website (Autism Island) has taken the time and thought through what you should and should not say to a parent or caretaker of a child with Autism. I think they are right on and would really appreciate you thoughtfully looking through these suggestions and taking them to heart. Let’s start with should NOT……. What do you think? Surprised by any of them? I would love your feedback and any questions if you have them. Feel free to leave a comment below! The ones I hear most often are #13, #23, #25, # 26, #33, #37, and #42. I do get annoyed when people try to pinpoint and figure out what could have caused Cannon’s Autism. I just feel that at this point……that is irrelevant. I KNOW that research must go on and try to figure out the cause. Absolutely! But for me, in my life, I don’t need reasons. I need help TODAY and for tomorrow. I can’t look back. It’s done. He is who God intended him to be. Now, my job is just to give the best chance at a great future. Congratulations! You have made it to the end of this exhaustingly long post! Hopefully it was worth it! I pray that these suggestions were helpful and will further provide awareness as to how best to SUPPORT families like mine. With a little love, awareness, and acceptance……this world can truly be a better place for ALL! God bless! Hi there friends! Well, I did it again. Took forever to tell you that we were home from the hospital. It’s actually been a couple hours shy of 1 week. SORRY! I had a lot of catching up to do, my mom was here from out of state, and I threw myself into a few projects while I had some extra help. We will be telling you about those soon! But for now….back to last week. Last Friday, we began the day continuing a 4th gallon of Go Lytely Solution that had been started the night before. But suspended it around the time that morning rounds happened. The official read of his x-ray had come in and the docs were no longer concerned about both the elevated air fluid levels nor the stool burden. All was better! We were so relieved! Just as a little perspective….an adult requires 1/2 – 1 gallon of this solution to flush the system and prep for a colonoscopy. But my 5 year old ALWAYS requires between 3-4 GALLONS of this stuff to resolve his impaction issues. There was still some dilation but the docs felt that was just from his colon getting so stretched out by the impaction. It will shrink back eventually. Cannon still had the CF test to go but he was so happy to get disconnected! Tubes were still in. But he was free to leave the room for the first time in 4 days. He played in the playroom, went to look at a big fish tank on our floor, listened to a man play a harp, and wanted to be pulled around and around and around in the wagon. We were probably in that wagon for a couple of hours. Just being free. He smiled a lot, read lots of signs on walls, sang some, said “Hi everybody” to quite a few people we passed by, and even let a therapy dog named Wolfie take a ride with him! But we still had that one last hurdle to jump. The Cystic Fibrosis Sweat Chloride test! We had a lot of discussion ahead of time about where we would do it (his room or the procedure room), who would be there for support, what meds would best help him relax, and what distractions we would try. With a kiddo like Cannon…..you have to have a plan and anticipate complications. And have a plan of what to do when those inevitable complications occur. We opted for the procedure room due to the bubble machine and laser projector that were new and we thought he might be interested in. He wasn’t however…..so we resorted to the iPad with his favorite show streaming via Netflix. In the room, were the tester, Mark, myself, his nurse, and a Child Life Specialist. He was given a dose of Valium prior to the procedure but it wasn’t enough and his nurse had to run get more part way through. Also, instead of laying him on the table…..which would require each of us to hold a limb and deal with his incredible strength and escape tactics…..I bear hugged him in a chair. This allowed Mark to hold one arm and give him support. While the other arm was held by the nurse so the tester could do her thing. And the Child Life Specialist held the iPad up where he could see it. It takes a village to get through a procedure with Cannon! 🙂 The application of the skin irritant, gauze, cuff with ultra low electrical current, and various wraps took about 30 minutes. (See the bolded section in the previous post for more info on the disorder and testing process.) It wasn’t easy but he did pretty well considering. I tried to focus, talk softly to him, and stay calm so my heart rate wouldn’t be elevated. Which might alarm him and/or make things worse. After the application, I carried him in the same bear hug fashion and we just walked the halls for the next 30 minutes. When the time was up, we all re-entered the procedure room…… except for Cannon’s nurse. A new big, strong, muscular male nurse arrived with orders to pull all the tubes when the tester was finished! So, we assumed the previous positions and the tester began unwrapping his arms and extracting the sweaty gauze. The sweat on that gauze would be evaluated for CF. And much quicker than we had been told. They would have the results in a couple hours. 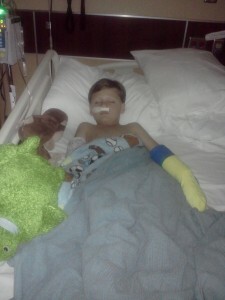 Then, we laid him on the table and the male nurse quickly began removing all the tape and restraints on Cannon’s arms. And pulled his I.V. And then the L-O-N-G N.G. tube from his nose. He fought us during the process but a quick hug was all he needed to calm him after. He was totally free and happy now! 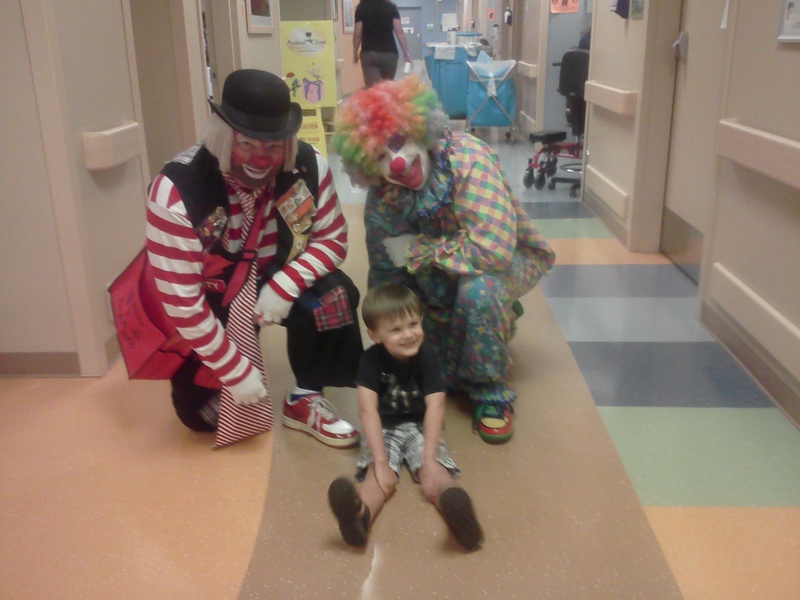 The Child Life Specialist gave him an “Act of Courage” bead for his Beads of Courage strand. For his great courage during the test. Makes a Momma proud! We immediately hit the showers! He was S-T-I-N-K-Y! Cannon got “squeaky clean” as he put it, lotioned up, in fresh clothes, and then gobbled up some broiled cod and a baked potato. The only thing on the hospital menu within the restraints of his diet. Well, for the most part. And then, he was off for some more fun in the playroom! About an hour later, the screaming and cramping began and he required some medicine to calm him down. 4 gallons of clean out medicine do a real number on his poor belly! At discharge, the resident came in and informed us that Cannon’s CF test was NEGATIVE! An enormous relief!!!!! Praise God! We were given dates for follow up appointments with our pediatrician and G.I. doctor, a couple doses of medicine to help with the cramping later, and we were out of there! Cannon was so happy! Later that night, I was putting the boys to bed when a totally cool thing happened. We usually jump into bed, sing 2 songs, and then pray together. Well, I sang one song and then asked them which one they wanted next. Townsend said, “I want to pray.” Usually, Mark or I say the prayer but Cannon (for the first time ever) spontaneously began to pray! He said “Dear God, Thank you that the yuckies are out, thank you that the tubes are out, and for playing in the D5 playroom. Amen.” I was floored and so excited! We praise our Heavenly Father for the incredible strength He gives Cannon (and us) to endure these long weeks in the hospital! 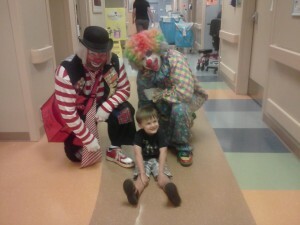 For the wisdom, individual attention, and impeccable care from the fabulous doctors and nurses at our children’s hospital. And for the needed physical help and constant, uplifting prayers we receive from family and friends. Our God sure is an AWESOME GOD! He supplies all our need. Even in the midst. God’s blessings to all of you! Much Love! When the Surgical Attending came by to consult on Tuesday, she recommended that he be tested for Cystic Fibrosis. At first, I was baffled. I thought this was only a condition that affects the lungs. So, I contacted a family in our church who have a child with CF for more info in somewhat layman’s terms. The dad is very thorough and sent me this response and explanation. “What CF does is create thick sticky mucus that smothers the lungs and/or pancreas. In patients that suffer from the pancreatic effects, the enzymes that the pancreas produces cannot reach the intestines to break down the food and extract nutrients from it. Hallmarks of this condition are poor weight gain despite a healthy appetite and frequent large, bulky stools. A telltale sign of a person with CF is extremely salty sweat. GI problems are a major contributor in an unhealthy CF patient. We decided to go ahead with the test. The docs aren’t terribly concerned that this could be a positive result for Cannon but there are so many mutations of CF, that it’s better to test for it and be sure. Rule it out. He will have this test done tomorrow morning and we should have the results in 24 hours. One cool thing that has happened this visit is that Cannon was enrolled in the Beads of Courage program. 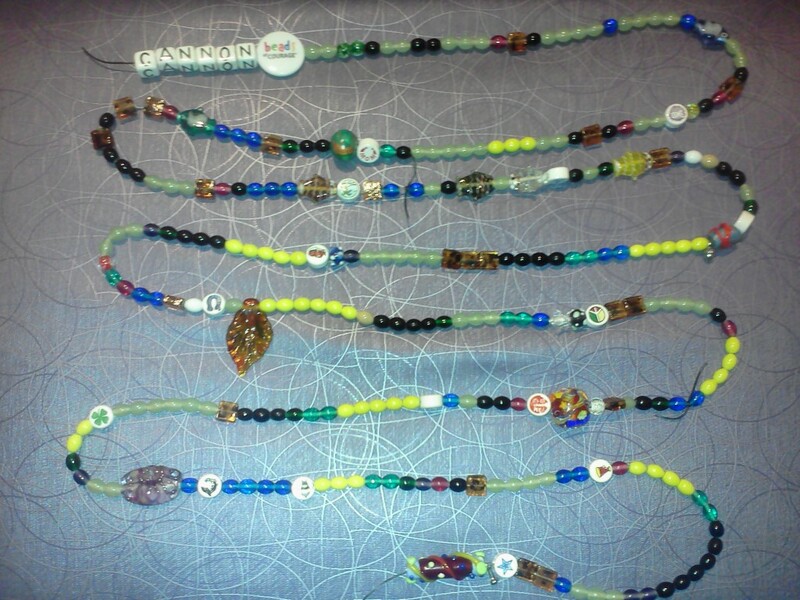 This program is all about “providing innovative, arts-in-medicine programs to help children and families with serious illness record, tell, and own their stories of courage.” So, Cannon was given a string with beads that spell out his name and an official Beads of Courage bead. Then, the Child Life Specialist who presented the program to me told me that the next step was that I had some homework. She knows me well and knew that I have detailed notes dating back to when this all started. She asked me to go through them and right down how many pokes, tests, procedures, surgeries, hospital stays, etc he had had. And then record them in his Beads of Courage journal. Once I had that ready for her, she would bring me all the beads and I could start stringing. She warned me the process could be emotional and she was right. Reading through 2 years and some change worth of struggle, pain, and just plain blah was difficult to say the least. I knew these years had been rough but when you read it like a book, it can be overwhelming. But when I was done recording and stringing the beads…..I had a weird sense of pride. Not because I am proud that he has these issues. NOT AT ALL! I was proud of him for all he has been able to endure. Proud of his resiliency. And proud that we now had something to validate ALL of those tough times. They are not forgotten. He should be able to wear them like a badge of honor. And now he can. Each color or shape of a bead symbolizes something. For example, yellow are for days in the hospital, light green for tests, tortoise for procedures, blue for clinic visits, and black for I.V. starts and blood draws. Then there are other speciality beads for things like special accomplishments or acts of courage. I was dumbfounded when it was complete. I couldn’t believe how many beads had been accumulated. Keep in mind…..he is FIVE….barely. And he has only had this issue a little over 2 years. AND this is not even his primary diagnosis! Autism takes up the bulk of our life. Anyways….please check out this org’s website and donate or get involved, if possible. I am so impressed with this program and thankful that it came into our lives. We plan to display his beads in Cannon’s new therapy room (coming soon!) so he will never forget how awesome he is and how strong he is! It has been a busy few weeks since we talked last. I have been trying to get my feet back under me from Cannon’s hospitalization, while also prepping for, raising money, gathering a team, and walking our local Autism Walk. And seeing an addition on our house to completion. Lots to tell you guys in the near future. Good stuff! But unfortunately first…….I have some not so good news. Well friends and family, since Cannon came home from the hospital 3 weeks and 3 days ago, I sensed something. Call it a sneaky suspicion, mother’s intuition, or whatever. But, I was just convinced that Cannon was going to have a quick turn around. Back to the hospital. I even voiced it to several people. After the initial cramping wears off, usually he has an INCREDIBLE week! He talks more, makes insane eye contact, and is so so very happy. But this time, he didn’t have that good week. At all. He seemed more frustrated and agitated than happy, go-lucky. We LIVE for that awesome week! It kind of drives us to get through the awful clean-outs because we know the amazing week is coming. But, it never came this go round. So, the first week was characterized by frustration and agitation. And the second followed it up with additional crying spells, begging for medicine, lots of hug requests, and an extreme increase in meltdowns. He was such a roller coaster. Having a good part of the day and a horrible rest of it. Enough to keep us guessing about what to do. To take him back to the hospital or wait and see what happens? Traditionally, when we have brought him back to the hospital early after treatment, the problem is air instead of impaction. Because of Cannon’s intense sensory issues, tons of air in his body (translation: gas) feels the same as an impaction. He reacts exactly the same way and there is no way to tell the symptoms apart. Without an x-ray. Now, the third week has continued all symptoms of the previous two and added loss of vocal control, uncontrollable screaming spells, bouncy, very disconnected, scripting constantly, and just intense hyperactivity. And he also mixed it up that week by being amazingly good in spurts. Like Easter Sunday, he sat through the entire church service! But Monday morning, he tipped the scales by screaming “Help Me” at the top of his lungs for 2 hours. We brought him right into the E.R. where he proceeded to play happily and hug everyone in sight. Further confusing me and making me doubt myself. Anyways, the short version of what happened next was that he got 3 x-rays taken and they showed significant stool burden and something new……elevated air fluid levels. The latter which caused the docs to call for a surgery consult. We were told that those levels can sometimes increase from an obstruction or also appendicitis. Surgery didn’t think he was in any immediate danger but wanted to keep a close eye on him for any changes. We went down to anesthesia later Monday evening and got the Nasal Gastric tube (N.G.) and I.V.’s inserted. Began the medicine (Go Lytely solution) around 2:15 in the a.m. and as I type this we are about 1 1/2 hours from finishing the first gallon. He will do a second and then take another x-ray to see where we are.